You guys, I’m soggy and lacking any and all motivation to peel myself from the couch and away from the new season of Unbreakable Kimmy Schmidt. It has been raining since…well, I can’t really remember a time when it wasn’t raining. I keep thinking, surely the sun will come out tomorrow. But it never does. I tried bargaining with Mother Nature. After that, I went as far as pleading. Now, I’m just pissed off and cursing her. She doesn’t accept bribes, either. Trust me, I’ve tried. When you can’t go outside and play, the only other option is to take it to the kitchen. 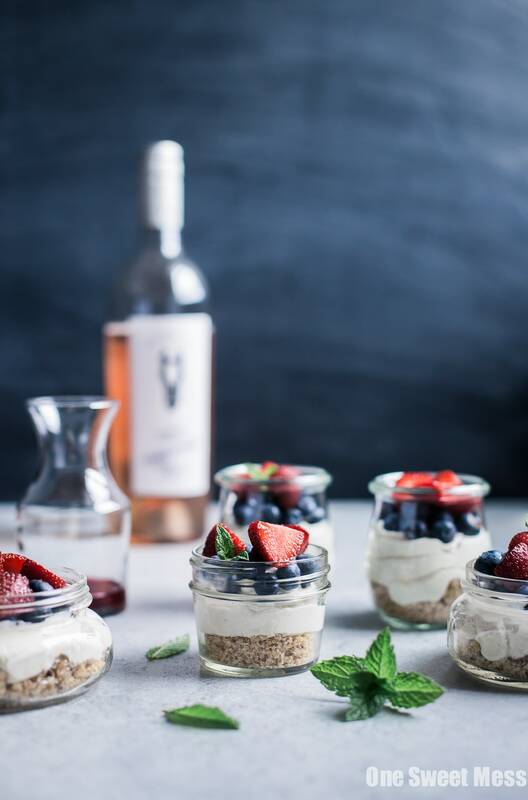 So I did, and this No-Bake Lemon Cheesecake with Rosé Glazed Berries is the result of boredom and extreme sugar cravings thanks to said boredom. Every little jar of cheesecake has been consumed and another batch has been made to take its place. Bikinis are so last year. The creamy lemon cheesecake layer comes together in less than 5 minutes, and the recipe only calls for 7 simple ingredients. The mixture is silky smooth, fluffy, and bursting with tart lemon goodness. I’ve never been a fan of the traditional graham cracker crust. In my opinion, it’s lacking in flavor and always ends up a soggy mess. For this recipe, I used a mixture of vanilla wafers, Diamond of California Sliced Almonds, brown sugar, melted butter, and vanilla extract. A few pulses in the food processor, and you’re good to go. And then there’s the Rosé glazed berries–oh my, my, are the tasty! The berries really are the highlight of this recipe. Rosé glaze is not at all complicated to make. It’s a mixture of Rosé wine and sugar. Bring the mixture to a boil over medium-high heat and let it reduce for 10-12 minutes. The result is a perfectly sweet glaze that pairs beautifully with the tart lemon cheesecake layer. Layer the trio in single-serving glass jars and serve ’em up all summer long. If you use a combination of strawberries and blueberries, you’ll have a red, white, and blue dessert that’s perfect for celebrating 4th of July. To make the cheesecake layer, add cream cheese, sour cream, and powdered sugar to the bowl of a stand mixer (or in a large bowl using a handheld mixer) fitted with the paddle attachment. Beat until smooth and combined. Scrape down the sides of the bowl and then add the vanilla and lemon zest. Beat to combine. With the mixer on low, slowly pour in the heavy whipping cream. Turn the mixer to medium-high speed and continue to beat for 2 minutes. To make the crust, add vanilla wafers, almonds, and brown sugar to the bowl of a food processor. Pulse until the mixture is a coarse crumb. Slowly drizzle in the melted butter and vanilla extract while pulsing. Continue to pulse until the mixture looks like wet sand. To make the glaze, add the wine and sugar to a small saucepan. Bring the mixture to a boil over medium-high heat. Allow the mixture to reduce for 10-12 minutes. You’ll be left with 1/4 cup of liquid in the pan. To assemble, spoon 3 tablespoons of the vanilla wafer mixture into the bottom of 6 jars (I used the 7.4-ounce Weck Tulip jars). Top with 1/4-1/3 cup of the cheesecake mixture. Add a layer of berries to each jar and brush the berries with the Rosé glaze using a pastry brush. Serve immediately or cover and refrigerate for up to 3 days. For the best result, I recommend assembling 2-4 hours before serving.